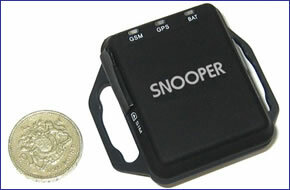 Snooper SPT220 Pet Tracker is a compact lightweight location device using the very latest micro GPS and GSM technology. Designed to attach to your pets collar. Snooper SPT220 Pet Tracker gives you the comfort of knowing where your pet is day or night. Ths standalone unit incorporates a built-in rechargeable battery which will operate for up to 15 hours on standby. To locate your pet simply call the device using a mobile phone and Snooper SPT220 Pet Tracker will return an SMS text message with the GPS co-ordinates showing its position. Snooper SPT220 Pet Tracker has been discontinued. View the latest range of GPS tracking devices here. Snooper SPT220 Pet Tracker can provide you with the exact position of your pet anytime day or night and with no monthly or annual subscription charges! For just the cost of a SMS text message you can easily monitor your cat, dog or even your horse by calling the Pet Tracker using a mobile phone. This ultra compact GPS tracking device comes as a standalone unit with a built-in rechargeable battery that can be attached simply and easily to your pets collar. Snooper SPT220 Pet Tracker also includes a FREE orange SIM card, this enables you to use the Snooper SPT220 Pet Tracker straight from the box. Please note: Orange SIM card requires an initial minimum top up of £5.00, text messages cost 10p per text. How does Snooper SPT220 Pet Tracker work? Step 1. Pair your mobile phone with the Snooper SPT220 Pet Tracker (internal SIM card). Step 2. Call the Snooper SPT220 Pet Tracker from your paired mobile phone. Step 3. Snooper SPT220 Pet Tracker returns a SMS text message back to the paired mobile phone, this text includes the exact GPS co-ordinates. Step 4. View the GPS co-ordinates using Google Maps either on an Internet enabled PC or mobile phone with suitable installed mapping software. Snooper's GPS tracking device uses the very latest Sirf III GPS technology to provide amazing accuracy to within 2.5 metres. Get the peace of mind of knowing exactly where your animal is at anytime day or night. If the Snooper SPT220 Pet Tracker can no longer 'see' the GPS satellites it will report the last known location via SMS text. Snooper SPT220 Pet Tracker internal battery which provides up to 15 hours standby battery life can be charged in-vehicle, via a PC and in the home or office.